You are here: Home / Is Outsourcing Destroying Our Local Economy? When you talk outsourcing there are definitely mixed opinions around the subject. I have been fortunate time and time again to see outsourcing help businesses grow and in this video I answer whether or not outsourcing can grow or shrink an economy. Hello and Welcome, David Judge here and in my last video I spoke about How much you should pay a Virtual Assistant. 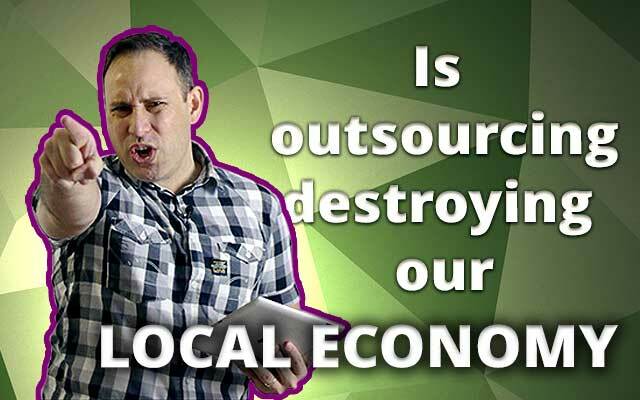 In today’s short video I’m going to answer whether outsourcing is destroying our local economy? Now that’s a big question and as I have been asked that question a few times I thought I would answer it head on and give you my real opinion on what I think, along with a real life example. Lets start by talking about what it’s like to be in business today and a few interesting stats. According the Australian Bureau of Statistics, the number of hours employed people (full time and part time) has actually decreased by approximately 1 hour every decade. For example in the 80’s the average hours worked 35hrs a week, then in the 90’s 34 hrs a week, the the 2000’s 33hrs and according to trends by 2020 it will be 32 hrs a week..
On the flip side the average hours for Business Owners is going up, with over 23% of self employed working 70+ hours with an average of 52 hours a week. That’s an extra 20 hours per week that a self employed person is working. Why Are Business Owners Working So Many Hours? So why do you think employees weekly hours are going down whilst business owners hours are going up? The short answer, Business owners are carrying more of the work to cut costs. And the style of tasks they’re doing in many instances don’t offer a direct Return On Investment but are still critical to keep the business alive and afloat. To make it even more challenging the hours a business owner needs to work (to be profitable) will just keep going up, unless they either go out of business or simply find another way of doing business. I know this sounds all doom & gloom but the reality for a number of our clients that approach us, is they understand they need work smarter rather than working harder. And this my friends, is one of the many reasons businesses outsource work to VA’s (virtual assistants). VA’s give business owners back their time and the ability for another person to perform these tasks at a much more affordable rate. That’s how outsourcing Free’s up the time of business owners and allows them to start living a lifestyle. But what about employing people locally and the fact that we’re sending those jobs overseas? Based on the statistics alone, business owners are reducing the hours they’re paying to employ people locally as they’re doing more themselves. But lets flip this around and think about the REAL RESULT of outsourcing. Now, I’m going to do this by example. A client of ours, was employing 2 receptionists in his office that were completing a number of tasks that included answering the phone, booking appointments, contacting other team members, preparing reports and more. He was paying these 2 people approximately 100,000 a year (including tax and super contributions). He would also pay sick leave and holiday pay and was having a number of issues working together, so he would have to performance manage them a lot, which meant he would have to work extra hours to pick up the slack. When we spoke we looked at all of the tasks we realised we could change his processes and have 1 VA replace one the receptionists in his office which would save him approximately 30,000 a year in staff costs. ok, now hear me out cause something very interesting happened next. The team members that worked off-site would hand write a report, which would then be transcribed by a person in the office and the average turnaround time for a report was 3 business days. Because he was outsourcing he changed what he was doing and bought all of his offsite team iPads and had them prepare the reports while they were on site. They would then email them to the VA to look over and compile into the report and the report would be sent within 24 hours to the client. What had effectively happened was he saved money and reduced the delivery of his product from 3 business days to 24 hours. This then made him stand out from the crowd and he got busier and I mean real busier. Before I knew it, he called me to get a second VA (as the first one was maxed out) and he had employed 4 more people locally to handle the workload. During all of this he went on an overseas holiday for 3 weeks(which was the first he’d taken in a very long time). He employed 2 VA’s (which were both tax deductions, as they were a business expense), let one person go from his business, employed 4 more people (so he was 3 people up), doubled his turnover and finally went for an overseas holiday for the first time in over a decade. VA’s free up the time of the team members to focus on tasks that offer a direct ROI and in many instances the employment of a VA have allowed businesses to continue to grow and employ additional locally skilled people. So in Reality, Outsourcing does the opposite and in fact shows time and time again to HELP the local economy and more importantly, gives a business owner back their life.